I recently decided to welcome 2015 with open arms and kick it off by developing a healthier relationship with food. I already had the workouts down, but with a diet that often consisted of emotionally ruled choices I decided it was time to focus on what I was eating more than what I was doing. I LOVE jalapeno poppers. Not just any, although I will eat most kinds, but my true addiction is the Jack in the Box ones. The gooey cheese, the seed-filled spiciness, and the fatty ranch to dip them is is the ultimate party for my mouth! There is a drive-through right by my house that I used to go by…a lot more than I would like to share…until one recent night on my reluctant last run for 2014. I had decided to start off 2015 I would not go anywhere that had a drive-through. 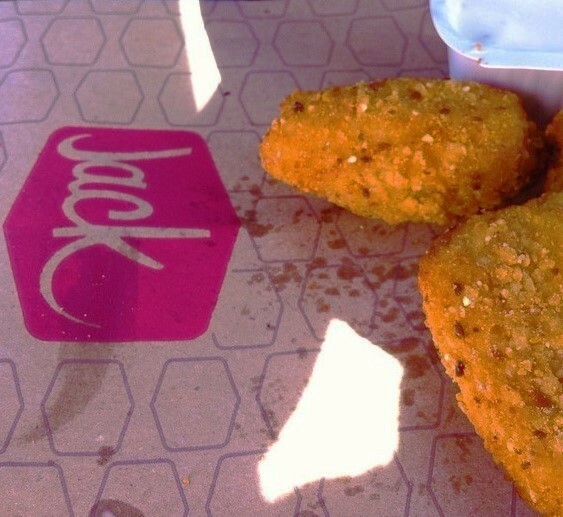 Alrighty, no jalapeno poppers from Jack for quite a while. This past week I was coming home from a friend’s house and realized this was the night. I had to drive-through one last time before I took a major break from crappy food. I drove up and ordered the poppers. As I pulled up to pay the guy he smiled, and shyly made a suggestion on another sauce I could try with the poppers. Instantly I smiled and with foodie enthusiasm and replied “YES! I’ll try that!” Boy did he look happy. Huh. Well there ya go. Goodbye to old habits, and in with the new. Want to start your new year LESS STRESSED and MORE BLESSED? I can help you be the change you wish to see for 2015!